The Svet are a race of hostile centaurs bred out of the Hyaendi Hills. The Svet are well known throughout the North, recognized as being the rulers of the North before the Anshedar had crossed over from the Strega’s Deep. The Svet are branded as barbarians and cannibals, which both hold true to an extent. These creatures are more frequently avoided than sought, even when considering the excitement of seeing a legendary horseman archer. Although many of the Svet stay in their Holy Lands, within their tribal settlements, those who venture beyond the Hyaendi Hills are frequently captured and enslaved by the Anshedar. The head, arms, and chest of the Svet are those of a human and the rest of its body, including four legs, hindquarters, and a tail is like that of a horse. The horse hair that covers their hide can be any color of the horses of the hills, but oftentimes will be a representation of the Svet’s lineage or family bloodline. The Svet are dark skinned with dark hair and penetrating eyes. The prairie leaves them open to the sun, and often they are found wearing nothing but the skin upon their backs. Some females wear enough cloth to cover their chests, but it is fewer than most. The Svet are large compared to other races. Males generally stand about seven foot tall and weigh around 2100 pounds. Females are slightly smaller. The Svet are heavy meat eaters, athletically built, and claim to be the quickest runners of the North. The Svet once ruled over all of the North, battling against the Vucari and the Vulkodlak for their Holy Lands. When the Anshedar crossed over into Maharia, the Svet were restricted to the Hyaendi Hills, their Holy Lands. The Svet believe themselves to be blessed by Svathevit, the God of War and Glory, and of the horse. In the major cities of the Svet, temples dedicated to Svathevit will be found with strong pillars mirroring the god. These temples hold all the valuables that the Svet retrieve during war times. The High Priest, who is lord of the city, consults with the gods called the Oracle within these temples. War is also instigated based on their religion. It is likely that the Svet will engage in war during the Sixth of Warmth, the Month of Sickle, after the Rujan festival. The Svet identify their motivation for life frequently around battle, victory and glory. The Svet are ruthless warriors on the battlefield. A great deal of pride comes from the Svet’s ability to endure battle. The Svet move together like the strong wind across the plain, without any break in their defense, ever vigilant in their attack. Their brother was their strength, and their sister was their mind. The Svet were not only conquerors and plunderers, but defenders of what once was, what is, and what is to be. Their home was their livelihood. If it were ever to be lost, it was said that they would dig their own graves. With that being said, the centaurs spent most of their lives protecting their temples, their lands, and their treasures. The Svet are the antithesis of the knight. The centaur creatures are ruled by their instincts, symbolizing violent lust, adultery, brutality, vengefulness, and hate. The Svet uphold excess, retaliation, and are more beast than man, despite their half appearance. The Svet are blunt in all things, if not in word than in action. The hand that holds the spear or the sickle is often quicker than their tongue or even their mind. The Svet are arrogant. The Svet are loud. The Svet are friend to none. If you are considered outsider, then you are considered dead. The Svet are creatures that are considered most hostile toward the humans of the North, the Anshedar. The Anshedar had come and taken many of their lands during the War of Tears. As a result, the Svet have sworn a blood feud against the Anshedar for eternity. In regards to other races, it is unlikely that other races will tread far into their lands without meeting an equal fate. The Svet perceive themselves as battle hardened warriors. 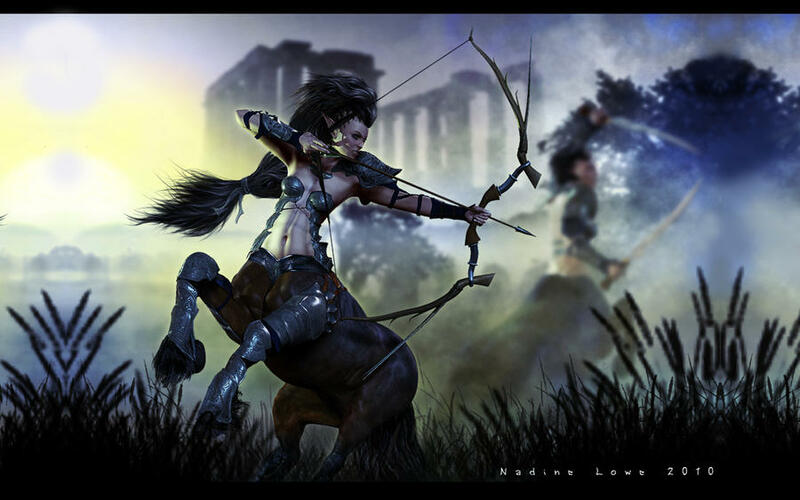 The centaurs are known for their long history of using tactical advantages over their enemies. If another race chooses to speak with the Svet, it is said to be wary with words spoken with the Svet for a word misspoken would inevitably lead to slaughter. The language of the Svet has no name. If anything, it would simply be called Svet. Regardless, most of the language was lost after the Anshedar disrupted their settlements in the North. To the Svet’s shame, they have adapted and more frequently speak Anshedarian. There is no written language among the Svet, but simply the passing of stories that circulate around legend and lore of their kind. Learn about other fantasy races in Thrice Nine Legends.